Under the persistent supervision of experts, we provide high quality range of Bimetallic Connector for Distribution Transformers. Our connectors are used in Distribution Transformer Industries,made available in different sizes and other specifications. These connectors are the best in quality and checked previous to dispatch. Offered connectors are precisely manufactured by our industry-experts using sophisticated machinery and optimum quality basic material. Our connectors are highly durable in nature. Established since last more than 18 years, at Smith Cast & Forge we are a group of young professional technocrats engaged in manufacturing of Aluminium Alloy Ingots and Pressure Die Castings, Gravity Die Casting & Sand Castings of Aluminium & Zinc based Alloys. 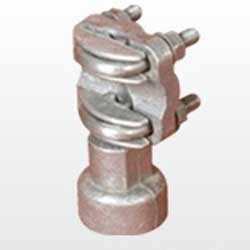 We are specialized in Castings of Transmission Line Parts, Distribution Transformer Parts, Textile, Automobile, Fan Parts, and Also All Types of Flameproof Junction Boxes. Backed by a well trained and experienced workforce in our foundry, we are always striving and challenging conventions to exceed our customer’s expectations in terms of quality, cost, development and delivery. Our biggest strength is to achieve this rapid growth has been a unique work culture always willing to learn and proactively contribute towards common goal of achieving excellence and high level of customer satisfaction. Our objective is to ensure maximum value addition to our customers by supplying quality products in time, every time and as per the client’s specification / drawing / sample. Our products are being supplied to various reputed companies in India and abroad, to their entire satisfaction. We have a strict online quality control system. Quality, being the highest priority, has become our culture and is reflected in every section of our operations right from the foundry ingot to the finished product. Metal chemistry is constantly checked by the state-of-the-art spectrometer. Physical properties are also randomly checked by Hardness Tester, Microscope and other relevant instruments. Also we have up to date testing facility and an excellent Quality Management System along with our well experienced quality control staff to check the quality of material right from inward stage to the dispatch of material. Our Vision is to emerge as a focused recognized global Manufacturing leader in the field of Casting that helps clients achieve their goals. We will accomplish our Vision through our commitment, outstanding service and real business value in the form of qualitative products to our customers.